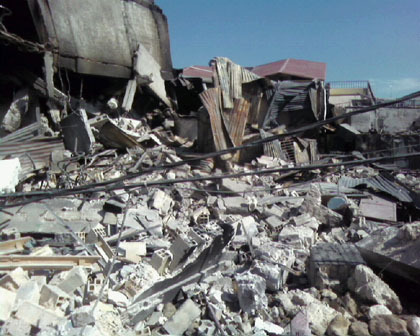 The remains of the Deslouches' house in Port-au-Prince, Haiti. Like so many Haitian-Americans, Samira Louis and her family eagerly awaited news of relatives in Haiti in the wake of the Jan. 12 earthquake. Within hours, the Louises were saddened to learn that the sturdy house in which her father had grown up in Port-au-Prince had collapsed to the ground. When they later learned that her aunt and uncle were on the second floor when the house crumbled, their sadness quickly changed to devastation. By the time Gaston Deslouches reached his wife, Adeline, it was too late; the entire structure fell to the ground while they were still inside. Louis and her family tried frantically to regain communication with their aunt and uncle, but were unable to get any information. Just as Louis’ parents arrived in the Dominican Republic, en route to Haiti two days after the quake, they got word that Deslouches and his wife had been rescued from beneath the debris and were safe. Deslouches, a Haitian-born Yale graduate and retired doctor, had returned to Port-au-Prince in order to provide medical care to the underprivileged. Louis’ parents, Marie-Lucie and Nikolai R. Louis Sr., flew to Haiti with only a carry-on bag of medical supplies and $200. Her parents told her that because there is so little food, communities pool resources and cook one pot of food for everyone to share for the day, but there is never enough to go around. Despite the overwhelming sense of worry surrounding the events in Haiti, Louis’s first instinct was to become involved with the relief effort. 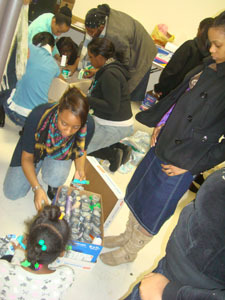 Samira Louis packs boxes to aid Haiti's earthquake victims. “When I actually realized the gravity of the situation, my initial thought was, ‘What can I do to help?’ ” Louis said. She decided to work with friends to create a donation plan of her own. The plan was a success. After two days, enough supplies had been collected to fill two church vans, and were delivered to the Charity Waters, a non-profit organization in New York. The donations were then flown directly to Haiti. Countless New Yorkers who are not directly affected by the disaster in Haiti have taken the initiative to participate in relief efforts as well. Tyler Fischer, 22, of Fort Greene, was wary of text message donations and chose to contribute in other ways. I loved the article. 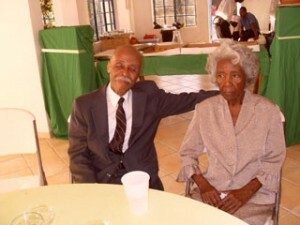 I look forward to hearing more stories about the Louis’ family and their journey in Haiti. I will pass on this article to others to read. I’m so proud of u sami for taking that extra step. And I couldn’t be more proud of your parents for going there even though they just came back from Haiti not quite 3 wks before, and the ‘timing’ couldn’t have been worse. keep us updated on everything, you are blessed. Samira – Your family is amazing and I’ll be sure to pass this article on to others as well as try to support the efforts to supply aid to those in need in Haiti. Great article and glad to hear your family is safe and well! I just thank God for your strength in this time. And your family is awesome for all that they are doing in this relief effort. Thank you for the article. May God bless you and family, and keep them and the people in haiti safe. Samira! I’m so glad that your helping out our people in Haiti. And I’m so happy aunt and uncle gaston are alright. I was devestated when I heard the news too. . . love you and keep up the good work. God bless you dear heart! I am a friend of your Aunt Tania and my daughter and Joseph are classmates and friends. We have been in constant prayer as soon as we heard! My church family is working w/organizations here to send money and whatever aid we are able to send! The school (KIPP Academy in Lynn MA),that the chilren attend are working w/ other charter schools to do the same! PRAISE GOD for the out pouring of love that is happening! Please know that He feels the pain and cares deeply for all concerned! Continue to look to Him for your strength to persevere through this time! You will be blessed and He will continue to show you and everyone His Face! There is obviously a lot to know about this. I think you made some good in Features also.Keep working, great job! I really like this site and Pavement Pieces » Blog Archive » Haiti Earthquake: Worry triggers involvement . I read about you on another site I found on Google and thought they had great views as well.